I had a client this week who fits that description. She had a situation that made it advisable to “wipe and reload” her Windows 10 computer. But ever since she bought it (brand new with Windows 10 pre-installed), she hasn’t used it much at all because she just doesn’t like the interface. It is confusing and unfamiliar to her. So, I decided that, since I had to reload Windows anyway, I would work to make it look and act as much like Windows 7 as I could. First, of course, I backed up all of the client’s data onto an external drive. Someone is likely to have posted step-by-step instructions, and, if you’re lucky, maybe even a step-by-step video. This step can actually take several hours. It is important NOT to turn the computer off, or attempt to do anything with it, during this time. Once Windows has been restored (in this case, Windows 10), it has to be updated and made current. This is done through Windows update. Windows 10 takes care of this without needing much help. Important changes were made to the Windows 10 interface with the Windows 10 Anniversary Update, one year after its initial release. These updates made it more like Windows 7 used to be, and less like Windows 8, which (Windows 8) Microsoft then retired (no longer supported). The Anniversary Update took about another hour to complete, and then Windows 10 wanted to install the rest of the updates necessary to make it current. All of this finally completed, and the Welcome screen appeared. At this point, I was presented with a series of questions. All of them merit careful consideration, as they can have far-reaching and significant consequences. They will largely determine how the computer is to be used, and the degree of privacy the owner will have. My recommendation (and what I chose to do in this case) is to choose NOT to enable anything that gives Microsoft access to my private information, browsing habits, email, contacts, etc. I turned all of those off. I chose to “Skip” logging on using my Microsoft ID. I chose just to log on locally to the computer itself. Other settings, including date, time, time zone, etc. are self-explanatory. Once I finished answering the questions, the Windows 10 desktop appeared. In the Anniversary Update, the Start menu is more like Windows 7’s start menu, but different enough to be annoying. 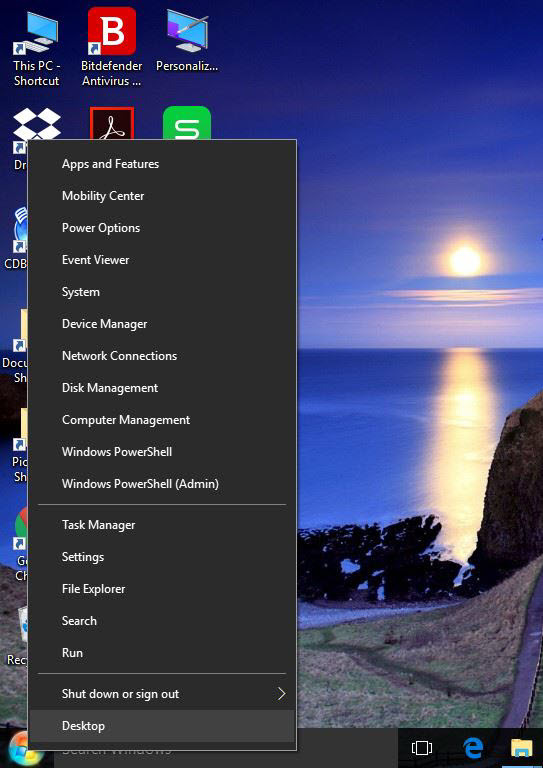 Your programs are there in alphabetical order, but you also get the “live tiles” that were introduced in Windows 8. Only now, they are part of the Start menu. I chose to right-click on each tile and Delete it. Access to other items like Control panel, Shut down, and more, are “hidden” and are accessed through right-clicking the Start button. The Quick Launch bar, task bar, and system tray (all along the bottom of the screen) are back, with the addition of the Cortana search box (which searches both your computer and the Internet by default). I chose to install a free program called “Classic Start,” which changes the Start menu back to the Windows 7 functionality. You can even change the button to be like the Windows 7 button graphic. After installation, I went into the Classic Start settings and specified that I wanted the right-click Windows 10 Start menu to work just like it did in Windows 10. That gives me the best of 7 (with a familiar look and navigation style) and the best of 10 (with increased functionality and useful tools). The best way to load Classic Start is through www.ninite.com. No matter which manufacturer you purchase from, they load your computer up with a boatload of junk, trial software, and links. I unloaded the programs that were not helpful through the Programs and Features applet in Control Panel, and deleted the links. I then went through the Start menu, and deleted links to websites, and any “leftovers” from the programs I had removed. I installed a few helpful free programs through www.ninite.com. I also made sure to install: a good antivirus program (my personal favorite is Bitdefender free edition), Adobe Acrobat Reader, a Microsoft Office Suite clone (my personal favorite is WPS Office free edition), the client’s Internet browser of choice, etc. I then went through every other setting (not just for Search, but for everything else too) to make sure my privacy was being protected as much as possible. Windows key + R on your keyboard brings up the Search Window. Type Regedit, and click on the Regedit program in the displayed results. Answer Yes to the warning box to allow it to make changes to your computer. Create a new key under “Windows” and name it Windows Search. Right click on the Windows Search key you just created and create a New Dword (32-bit) named AllowCortana. Make sure the value is set to 0. Right click on the Windows Search key you just created and create a New Dword (32-bit) named ConnectSearchUseWeb. Make sure the value is set to 0. Using the “Personalization” display settings, I restored color to the title bars in the windows, which are just plain white in Windows 10. Finally, I restored two things that Windows 10 was missing, which are in Windows 7: a program to play DVDs and the Windows 7 games set. You can read more about this process in a previous post here. 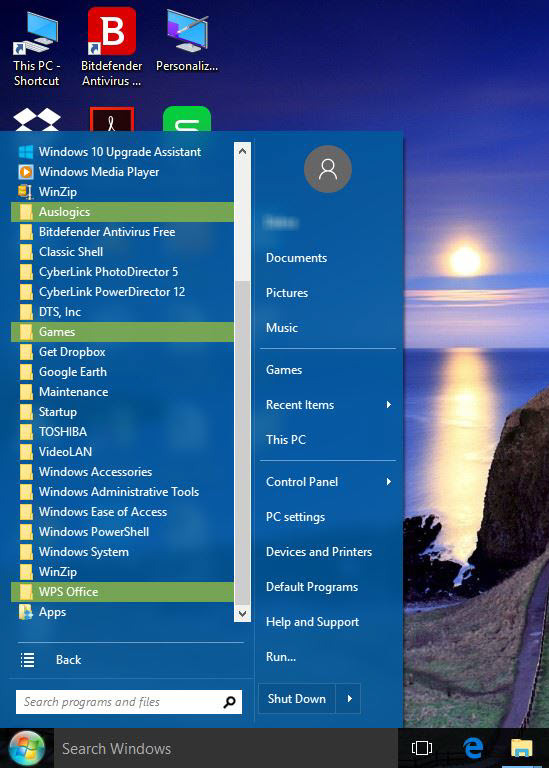 The end result was a leaner, cleaner, more familiar Start menu with the same links that Windows 7 used to have, and links to desired programs displayed on the Desktop, which most people have used since Windows XP. Very easy to navigate, and making it easy to find what you’re looking for. It is the easy way to get to Settings and File Explorer (like an enhanced Windows Explorer) as well as some additional tools. There is quite a bit of work involved in this process, but for those who really hate the Windows 10 interface, the result can definitely be worth it. Good luck, and happy customizing! *Disclaimer: Just a reminder that any advice or recommendations on this website which you elect to follow are suggestions that you try entirely at your own risk. I assume NO responsibility for any negative outcomes or damage to your computer or Windows.